The way that tortoises are being kept today has altered dramatically from how they used to be regarded in the past simply as garden pets. In many cases, they would be expected to live outdoors on a permanent basis, only being transferred indoors to a shed or similar outbuilding for hibernation. Some were even left out throughout the winter too. Over the past 30 years, however, since tortoises started to be widely bred as pets, the indoor accommodation used for youngsters has altered little in appearance. Contrast this with the aquarium hobby, where the design of tanks has been transformed by the use of new materials, to create stunning, eye-catching enclosures. Young tortoises today are still being reared just like their parents in many cases, in open-topped tortoise tables. These do, of course, give better ventilation than a vivarium, but they are not exactly decorative items of furniture to have in the home. Nor in a number of respects are they very functional either. 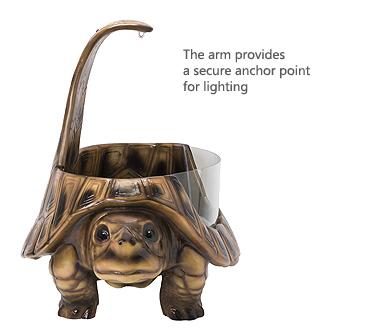 There is usually no hide included, which is something that young tortoises require, and the right-angled corners of the table can allow them to shimmy up the sides, putting a tortoise in danger of tumbling either several feet down to the ground if they get to the top, or falling backwards into the enclosure. Cleanliness can be an issue too. 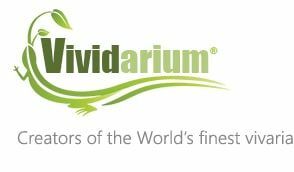 So what makes the Vividarium® Tortoise Home special? There are a lot of distinctive characteristics, indicating how much thought went into its creation, although it is its appearance that is most striking, when you see one of these units for the first time, compared with what has been on the market previously. “Each unit is hand-finished, with stunning air-brushed glossy paintwork, so every one is as individual as a fingerprint,” says Les. “These enclosures are manufactured from lightweight resin, which means they are easy to lift and manoeuvre, as well as being waterproof. They’re easy to clean and won’t rot either, giving them a long lifespan.” The flexible nature of the design means that any suspended style of basking lamp, or clamp lamps that can be attached to the side of the enclosure, can be used with it. The unit comes complete with a metal clip that attaches to the upper shell, from which the lamp can be suspended. This adaptable system means that you can choose your own lamp or lamps as required, to provide both heat and vital ultraviolet lighting. The appearance of the unit is not spoilt either by trailing electrical wires. These can be tucked away neatly into the cable clamps fixed on the rear of the Tortoise Home, indicating the attention to detail that has gone into the design. There is scope to decorate the open area with artificial plants, or even living ones, if a suitable plant light is used above them. This will also give the tortoise a greater sense of security, mimicking its wild environment more accurately. Young tortoises often spend quite long periods hiding away in vegetation, where they will be safer from predators. Furthermore, a hide is incorporated into the head end of the enclosure, measuring 15cm (6in) in depth and providing a retreat for the tortoise here. 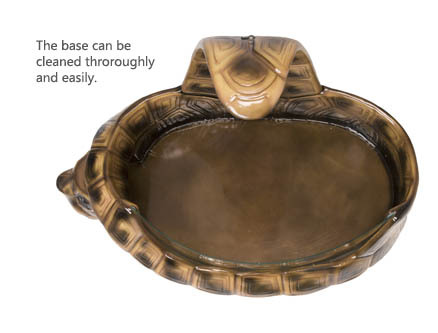 “I wanted to avoid a major design flaw seen in standard tortoise tables, in terms of square corners, when it came to producing the Vividarium® Tortoise Home,” admits Les. 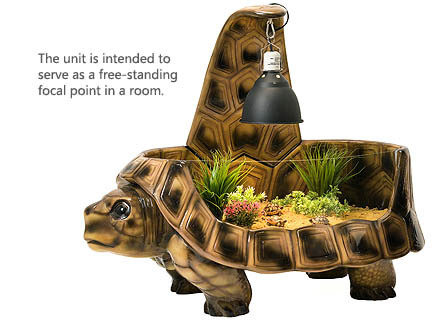 “These encourage tortoises to climb, and they are surprisingly adept at it. So in this case, there are no corners. Our enclosure is oval in shape, thus making it very much harder for a tortoise to clamber up the sides. 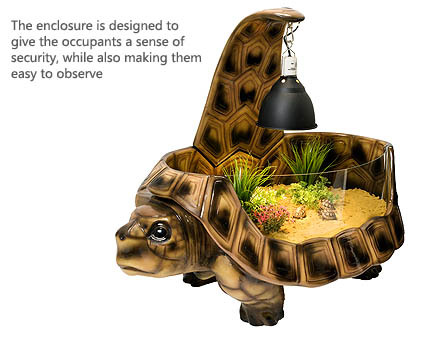 “Aside from being created to minimise the risk of injury, the open top design also allows for good air flow, and encourages the tortoise to thermoregulate as well, adjusting its position according to its temperature, just as it would outdoors. You can keep a check on the temperature by means of a temperature probe, bearing in mind that room temperatures tend to alter through the year,” adds Les.